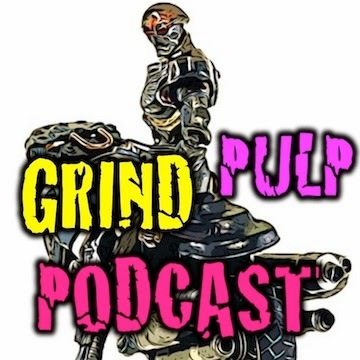 In this episode of the Grind Pulp Podcast, we’ll be taking a look at MECHANICAL VIOLATOR HAKAIDER, the thing Robocop checks under his bed for. Andrew has a Bone to Pick with Matt in a new segment. On the Lowdown, Jeronimo’s been catching up on some of the latest movies, including KNIGHTS OF THE DEAD. Manga Matt gushes about the scifi, dystopian manga BLAME!, and Andrew mentions his latest movie viewings. After our feature presentation discussion, listen in to hear what flicks each of us have kicking around on our personal top ten Grind Pulp movie lists. It’s Manga Matt’s movie pick! His film topic de jure, MECHANICAL VIOLATOR HAKAIDER. Can style and over-the-top special effects trump slim servings of substance? Jump in to find out.